SWIX is a tool that allows social media marketers to track the success of their campaigns across several different social media properties. 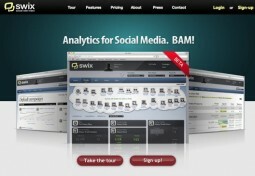 It aggregates social media stats from all sorts of tools and give them to you in one dashboard. Lastly, SWIX also allows you to assign dollar values to your social media efforts to calculate the ROI of your activities. It’s like Google Analytics for Social Media.